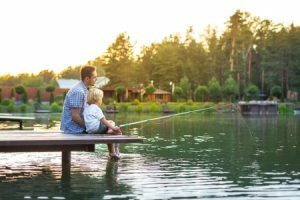 As an avid fisherman, you’ve been waiting for the day to share this wonderful activity with someone and pass on your angler knowledge to the next generation. When the time comes to take the kids out on the water, make sure you’re ready with these few helpful tips! Start with the basics when taking your child fishing for the first time. You don’t want them to get overwhelmed with all of that fishing jargon when their first lesson should really focus on the basics. Show them the simple steps of baiting and casting, then be there for any questions they may have. The techniques and fishing combos can wait for when they’re older. You should know as well as anybody that a child’s attention span is not the most reliable. Therefore, a full day of fishing out on the boat might not keep them interested and may actually deter them from liking the outdoor activity. Play it safe by planning to fish for about an hour. Then if everyone’s having a good time, stay out longer! It’s negotiable that some parts of fishing can be boring, especially to a child that’s been sitting patiently waiting for a fish to bite. Keep the adventure fun by including them in the parts they’ll find most exciting. If your child is a big fan of worms and insects, maybe spend a little time learning about baiting. Another great way to get them excited about fishing is having them reel one in for themselves. Call them over when you hook one and they’ll receive the hands-on experience that might get them to truly enjoy the sport. Last, but not least, you need to take your kids to where the fish are abundant and active. Why not consider a place where walleye, northern pike and lake trout swim about in the beautiful Northwestern Ontario wilderness? A trip to Mattice Lake Outfitters is perfect for your next family adventure. Give us a call at 1-800-411-0334 today to start planning your trip!